A cancer of the blood, leukemia occurs when bone marrow begins to produces abnormal white blood cells. The four main types of leukemia are classified by how quickly the disease progresses as well as the specific type of blood cell affected. Leukemia affects two types of white blood cells, lymphocytes or myelocytes, both of which fight disease. Lymphocytes fight disease and infection on a wide scale whereas myelocytes are white blood cells that fight bacteria, generally within the bone marrow itself. Two types of leukemia can affect each type of cell, acute and chronic. Acute myelocytic or lymphocytic leukemia presents with a sudden and severe onset, whereas chronic myelocytic or lymphocytic leukemia are slower in developing. The exact causes of leukemia are not known, however some research suggests that environmental and genetic factors, such as being exposed to toxins or a family history, may be indicated. Symptoms are not necessarily indicative of leukemia, but should be checked by a doctor, as early diagnosis and treatment is often a key factor in recovery. When patients present with leukemia-like symptoms a physician will perform a comprehensive physical exam, including checking swollen lymph nodes, liver, spleen and other organs. Because the disease causes an abnormally high level of white blood cells, leukemia diagnosis includes blood tests that will check white and red blood cell and platelet counts as well as hemoglobin levels. A bone marrow biopsy is preformed if the physical exam and blood tests indicate severe white cell abnormalities. 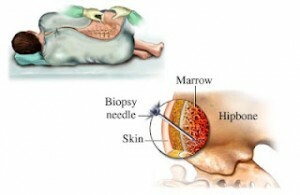 Usually taken from the hip area, there are two methods for collecting bone marrow. A bone marrow aspiration is the lesser invasive of the two procedures, involving removing a sample of bone marrow with a hollow needle. A full bone marrow biopsy requires the use of a thicker needled to remove a section of bone as well as a sample of the marrow. Cytogenetics tests examine the chromosomes of the biopsied bone marrow cells and blood samples to determine the specific type of leukemia. Spinal taps remove cerebrospinal fluid which surrounds the spinal cord and brain,. As with a bone marrow biopsy, a long needle is inserted, usually into the lower back near the spine, to remove the fluid. X-rays are taken to examine organs and lymph nodes for signs of abnormalities. Due to advances in medicine, several treatment options are available for leukemia. Treatment options generally depend on the age of the patient and overall health, the type of leukemia and if the cancer has progressed, or spread, to the cerebrospinal fluid. In some cases, if the cancer has advanced, a combination of treatments may be indicated. Watchful waiting takes an approach where the disease is watched closely to see if it progress. In some cases of chronic leukemia, where the disease is not advancing, no immediate treatment may be needed. However, people diagnosed with acute leukemia must begin treatment as soon as possible. The goal in treating leukemia is to destroy enough of the abnormal cells so the symptoms subside, known as remission. Once the disease is in remission maintenance therapy is often given to prevent a relapse and, in many cases, may eradicate the disease altogether. Chemotherapy refers to administering any number of antineoplastic drugs designed to target rapidly dividing cells. Antineoplastic drugs are highly effect at their task. So much so they also target rapidly dividing healthy cells, such as in the digestive tract and hair follicles, which is why chemotherapy patients most often lose both their hair and their appetite. Radiation therapy is sometimes indicated in patients, especially young children, who show signs of disease in the spine or brain, or have an elevated risk of the disease spreading to those regions. Bone marrow transplants may be indicated in severe cases of leukemia where the disease cannot be controlled through other methods. The patient’s own bone marrow is destroyed with radiation and donor marrow is transplanted into the patient’s bones. Bone marrow transplants are risky and require a high degree of genetic matching between patient and donor for the transplant to have a chance of success. While the leukemia is destroyed when the patient’s own bone marrow is irradiated, as separate disease called graft vs. host can result. Because the bone marrow is the heart of the immune system, the new marrow may reject the host body. When this happens, GvH is controlled with carefully regulated doses of steroids which suppress the new immune system just enough to keep it from killing its new host. Clinical trials, where new experimental drugs are tested on patients, may be a possibility for patients who have not responded to traditional treatment and are not candidates for bone marrow transplants.